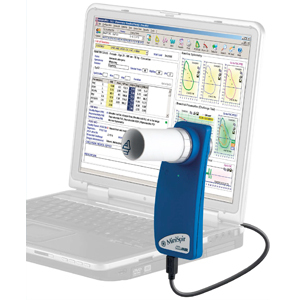 State of the art spirometer for use with direct connection to PC via USB Port. No batteries or additional connections required. Comes with WunSpiro Pro software and includes reusable turbine. Choose between two different flowmeters - reusable turbine for long term operation or Disposable turbine for single patient use. Up to 100 test memory capacity and online PC connection. Stored test results can be printed by connecting the unit directly to a standard parallel printer. The printout gives a full spirometry report with Flow/Volume curve, results plus predicted values. Choose between two different flowmeters - reusable turbine for long term operation or Disposable turbine for single patient use. Up to 100 test memory capacity and online PC connection. stored test results can be printed by connecting the unit directly to a standard parallel printer. The printout gives a full spirometry report with Flow/Volume curve, results plus predicted values.The spirobank and spirobankG have the same set of options, the only variation is the display. 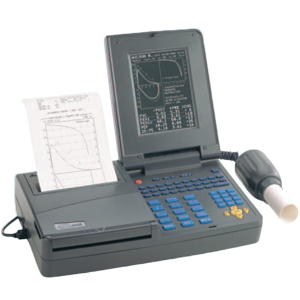 A spirometer with 6000 spirometry test memory capacity and Oximeter with1000 (40 days) oximetery recording. It comes with a blue tooth connection to printer or mobile phone and is available with disposable or reusable digital turbine flowmeter. It has an internal temperature sensor for automatic BTPS conversion and patient identification by name or ID code. 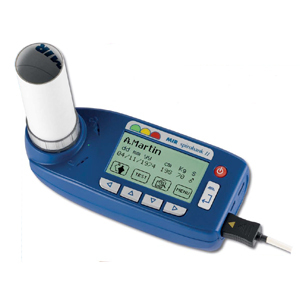 Ideal for mobile spirometry testing the Spirolab is simple and rapid to use and requires no calibration. With over 30 parameters with automatic interpretation and test quality control it has a user friendly keyboard with dedicated function keys plus alphanumeric data entry. 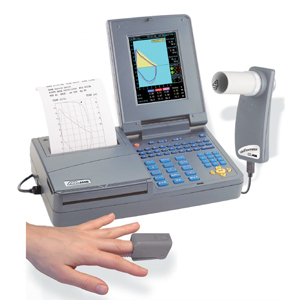 A Spirometer with 6000 spirometry test memory capacity. It is Medical Director(tm) compatible with blue tooth, usb and serial connections. It has an added SPO2 function. 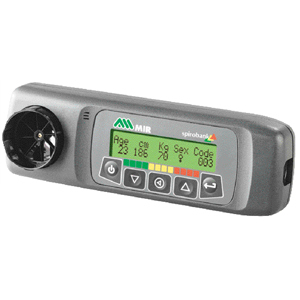 Available with disposable or reusable digital turbine flowmeter and a high resolution colour screen It has a fast but silent thermal printer and a full alpha numeric keyboard. The Spirolab 3 comes with WinSpiro Pro Software and Carry Case Included.